Condition is Pre-owned. These shoes were worn for a Two hour mountain bike ride. L ike new condition. T he bottom of shoes do have minor wear visibility. Hi, For sale is a pair of Fizik R5 Road Shoes in Blue, size EU44. I got rhed last August, but decided not to use them until my new bike was delivered. I have put new cleats on them, included in sale. 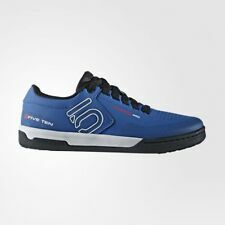 While waiting on new bike, I have decided to go back to spd shoes. Unfortunately I have thrown out the box, but the shoes are effectively new. Sale also includes second set of new cleats. Thanks for looking. 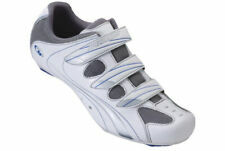 Neues AngebotSidi Dominator 7 Cycling Shoes. Sidi Dominator 7 Mega, Size 44.I bought these shoes new and have worn them once to an indoor spinning class but they are unfortunately too big for me. I have listed them as new with defects purely because the soles are marked from attaching the SPD cleats which is to be expected, there are no other faults with the shoes and are as new. UK postage only. Insole: Patented COOLMAX® Ergo Air® insole for riding in all weather conditions. Bumpers: Replaceable heel pad (ref. # 1487229). Shoe Technology : RACER FIT: High-performance fit reduces stack height to pedal - Increased arch support and power transfer. Easton EC90 Carbon Soles w/ Vibram Rubber. 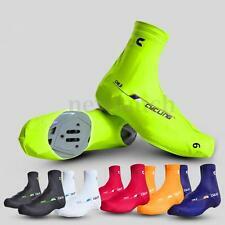 Cycling Shoes. We serve as an outlet for the cycling and outdoor community to turn over their no longer needed gear. Only the shoes are included, no sole inserts or mud spikes. These Northwave Blaze Plus MTB Shoes feature a triple-density Carbon sole and an ultra-light BioMap upper, providing support and comfort for whatever type of trail you're on. A full Speedlight 3D carbon sole has 3 carbon layers drastically reduce thickness while increasing stiffness. Mavic Echapee Trail EliteShoes. Our marriage began with cycling, our favorite is traveling the best way possible by bike of course. We love finding good deals on products but our favorite part is passing the bargains on to you! The X-Comfort Zone creates a dynamic, non-constrictive fit for the foot’s natural toe splay, which improves power, reduces injuries, and creates unsurpassed comfort. Style and performance can go hand in hand, the Platinum shoes are proof of that. Vittoria 1976 Classic shoes. Nylon sole. Thus the Onyx is designed to be comfortable and efficient when riding. 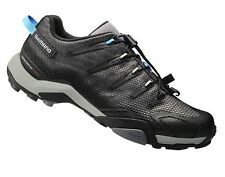 Its hiking outsole ensures flexibility when it's necessary to walk and to go full throttle when the trail feels like it. 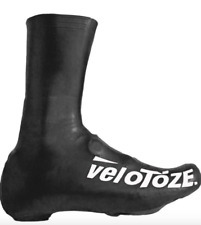 Power Zone: Increased arch support and power transfer. The handmade carbon composite monocoque Vaypor XC is designed for performance. Vents favour an optimal air flow in and out. Size: 8.5 UK / 42 EUR / 9.5 US / 27.3cm. - KEY FEATURES -- Skin Overlap under construction provides the perfect snug fit and distributes pressure more efficiently across the foot for superior comfort. LAKE Triathlonschuh "TX222" Obermaterial : atmungsaktives NuFOAM aus Textil-Synthetikfaser mit anti-bakteriellem Trek-Dry Futter Laufsohle : LAKE Race 100% Carbonsohle Verschluss : Doppelter Klettverschluss, weiß/schwarz. Mavic Crosside Shoes. Our marriage began with cycling, our favorite is traveling the best way possible by bike of course. We love finding good deals on products but our favorite part is passing the bargains on to you! La tomaia attillata ha un sistema di chiusura Boa® L6. CHIUSURA Sistema di chiusura con Boa L6 e strap per calzata anatomica. CELL 339/6645125. P.IVA IT03662960610. VIA NAZIONALE APPIA,114 CASAPULLA (CE) 81020 ITALIA. Available in 38-49 EU sizes. Octane 1:1 Power Plate: Octane Grade Uni-Directional Carbon for feather-light stiffness; Direct-Vent technology for cooling and drainage; concave shaping for ultra low 6.5 mm stack height, enhanced plate stiffness and anatomic support. (Senkel etwas ausgeblichen, Sohle fleckig). Details: Ledersole - Obermaterial Leder - Made in France. (bootlaces lose color). Grösse : EU 41 - UK 7 1/2 - USA 8.5 - Japan 26 - 26 1/2. This shoe has been reported to run small. New to mountain biking?. Then the Sapphire MTB Shoes are for you. A reflective section on the heel improves low-light visibility, while a Hot Stuff insole boosts breathability and adds arch support. LAKE Triathlonschuh "TX312" Obermaterial : atmungsaktives NuFOAM, Feuchtigkeit absorbierende Schale mit anti-bakteriellem Trek-Dry Futter Laufsohle : LAKE Race 100% Carbonsohle Verschluss : Doppelter Klettverschluss und Fersen- BOA -System für schnellen Ausstieg, weiß/rot. The upper is outfitted with fi'zi:k's perforated Microtex material for high comfort, durability and breathability. Closure: Boa IP1. © 2004 - 2018 Cyclingdeal USA. Insole: fi'zi:k Cycling Insole. We've also made links with international suppliers, buying direct to cut out the middleman - better prices for everyone! 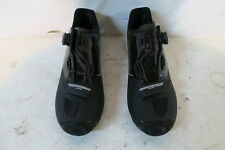 Specialized S-works Mountain Bike Shoes Black 43 UK 8 9 . Condition is Used. All BOA adjuster works as they should. New Specialized red footbed(the ones come with the shoes) as I use blue ones All threads on the bottom of plate are good Comes with used Shimano SPD cleats Only used handful of times before I go back on to flat pedals. All leather with slightly stiff rubber soles good for walking or cycling. There is no provision for attaching cleats to these shoes . They have been worn literally once, and are in virtually new condition. shimano SH-RP901 Road shoes Carbon Size 42. Shipped with USPS Priority Mail. Skate styled sole with SPD. Both resulting in great value for money for you! Size: 9 UK. Durability from synthetic upper. Lace coverage and adjustability from lace keeper design. Skate style grip through rubber sole. The outsides of the shoes and the insoles are very clean and show no signs of wear. Shoes are like new and in excellent condition. Length: 12.5". Insoles: 12". Starting with a fiberglass-reinforced nylon soleplate and multi-density rubber sole, Shimano tackled the fine line between grip, stiffness, and ever-so-important durability. When cleaning the next hill simply isn't in the cards, you'll appreciate the ability to install studs so you can at least walk comfortably up the hill.Profile grooves with variable density and soft arch support for added stability when pedaling Suitable for Shimano SPD pedals. 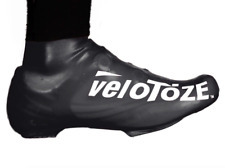 Insole: Patented Ergo Air® insole for riding in all weather conditions. RACER FIT: High-performance fit reduces stack height to pedal. Bumpers: Replaceable heel pad (part # 1487229). 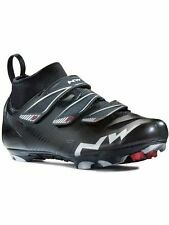 Scarpa mtb EL GATO ULTIMATE SPECIALIZED N.O.S. Scarpa Specialized, NUOVA, rimanenza di magazzino, ORIGINALE ANNI '90 N.O.S. Easton E70 carbon composite outsole. Matte black. Size US 9 EU 41. Compatible with SPD or SPD-SL type cleats (cleat plate not included). An NRG Air carbon reinforced Nylon sole provides stiffness, whilst the AirFlow System channels fresh air inside the sole and allows your feet to breathe. Clean, modern style and a versatile, supportive form make the Treble II™ a popular choice for everything from spin classes to centuries. The stiff, injected nylon outsole is outfitted with our new Universal Cleat Mount system that accommodates both three-bolt and two-bolt cleat/pedal systems. The lace-up construction with elastic lace-holders is lightweight and easily adjusted, while the outsole is semi-rigid to make walking in them easy. 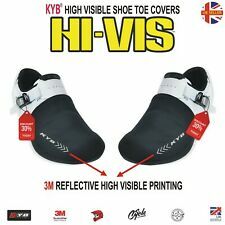 A Cool Stuff insole provides excellent ventilation and arch support, while the heels feature an eye-catching reflector for improved visibility at night.